PROTECT CIVILIANS: Commit to creating a safe zone for civilians, and take all necessary measures to guarantee its security. 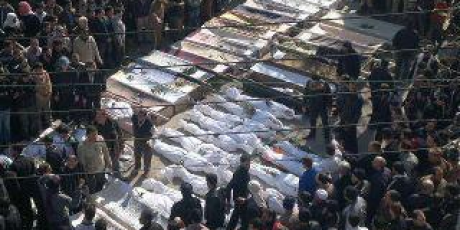 Any watered down compromise or hesitation will renew Assad's license to murder his people. We call on you to act now. With each passing day, Syria's crackdown on democracy protesters reaches new levels of horror -- bombing crowded neighborhoods filled with innocent civilians, cutting off electricity and phones so families can’t call for help, and blocking medical aid to the wounded. But finally a flicker of hope is emerging that could stop the terror. After the UN Security Council failed, Syria's neighbours in the the Arab League are taking the lead. They have called other key powers to an emergency meeting in 72 hours in Tunisia, and Avaaz will be sitting at the table with the Syrian democracy movement to deliver a clear mandate for strong action. Let's make sure this meeting ends with a comprehensive plan to end the bloodbath, not another watered down compromise that renews Assad's license to murder his people. A one million strong petition will show that people across the world are watching and expect urgent action to end this humanitarian catastrophe. Sign the petition on the right -- we'll bring it directly to the delegates in the meeting.